Taking c﻿﻿﻿are of a baby may seem like a daunting task since babies require a lot of attention to ensure that they are comfortable. Do you know that your little bundle of joy also has some grooming issues that need to be addressed? One of the grooming tasks is always to ensure that she has short nails. Clipping your baby’s nails may seem like a scary proposition since she has very tiny and delicate fingers. Trimming her nails is not just for grooming but is also a safety measure you need to take to prevent her from making a mess out of her cute little soft face. A baby’s nails which grow very fast are usually soft and flexible. Due to their fast growth, they can easily become jagged with sharp edges when long. As a result of a baby’s natural curiosity, cuts on your baby’s face and skin will be something you will have to deal with every day and who knows if she might decide to poke her fingers in her eyes as she tries to rub them. Your face will also not be spared from her long and sharp nails. What of the other babies who may want to play with her? Some parents may choose to use mittens to cover their babies’ hands to prevent them from clawing their faces. However, this is not the best way to go since using mittens will be limiting the baby’s freedom to explore with their fingers hence hindering their development. Her fingers should be free so that she can touch and feel things around her. She should also be free to put her fingers in her mouth. To ensure that you don’t hinder your baby’s hand movement while at the same time eliminating the dangers of cuts and bruises on her face, you should use some of the best baby nail clippers to keep her nails in check. Using a pair of baby nail clippers, hold your baby’s hand firmly and gently to avoid hurting her and then clip the nails. Care must be taken to avoid clipping her skin accidentally by pressing the finger pad away from the nail. You should ensure that the room is well lit so you can clearly see what you are doing. Ensure that you cut the fingernails along the curve of her fingers. The toenails are easier to cut since you just cut them straight across. Toenails also require less maintenance due to their slow growth, so your main worry will be the finger nails. You can then use an emery board to make the rough edges smooth. Clipping the nails is always easier when the baby is asleep since you won’t encounter any resistance. She won’t even know it. You should, therefore, remember always to keep a clipper in your diaper bag so that whenever your baby is asleep, you can seize the opportunity and trim her nails. If she is awake, trimming her nails may be a little difficult if you are doing it by yourself. You will, therefore, need someone to help you by holding the baby’s hands for you while you clip or distracting the little one with some song. Should you nick her skin accidentally, you can use a piece of a clean damp cotton wool on the cut to stop the bleeding. Don’t use a plaster since your baby’s fingers may soon find their way into her mouth and she might choke on the plaster. Avoid biting your baby’s nails to trim them since you might take away too many nails from the fingers because you won’t be seeing what you are doing. You will also be introducing germs onto your baby’s fingers from your mouth. When looking for the best baby nail clippers, you shouldn’t just go for any nail clippers just because it has the word ‘baby’ on its name. One of the things you need to look at is the size of the clipper. The size of the clipper should make it easy to be used on tiny fingers that your baby has. Ordinary clippers aren’t suitable for use on tiny fingers. They might also be too sharp for the baby’s nails which may cause massive cuts on your baby’s fingers. Another quality that you should be keen to look out for is the design of the baby nail clipper. The nail clippers should have a design that will give you a firm grip when you are using it. The material used to make it should also be stainless steel which doesn’t usually harbour germs. Going for baby nail clippers with a few extra ad-ons like a magnifying glass will also be a good decision. 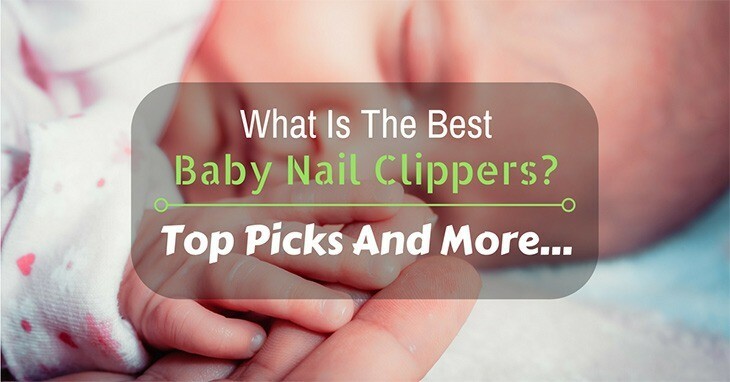 To get you started, below are some of the best baby nail clippers that you can choose from. Made by the American Red Cross, this awesome nail clipper is of a high quality and is also one of the safest baby nail clippers. This nail clipper is thoroughly tested to ensure that it is safe to be used on babies as young as one-day-olds since some babies are born with long nails. The blades are made of stainless steel. A 4X magnifier that is removable. The blades are small enough to fit your baby’s little nails due to their perfect shape. The 4X magnifier attached to its top ensures that you don’t strain your eyes while trimming your baby’s nails. It is very easy and comfortable to hold them due to their ergonomic sure-grip shape. They can also be used on older children and adults. It is made of stainless steel that does not harbour germs. Are very cheap as compared to others. It takes some time and concentration to avoid snipping the fingers. With an adorable design, your baby will not only have her nails trimmed but will also have a smile on her face during manicure time. Even you the parent will find yourself loving this cute and effective baby nail clippers. It also comes equipped with a magnifying glass so you can see your baby’s tiny digits clearly. A magnifying glass that swings out of the way. Nail catching feature for easy clean-up. It has a built-in fingernail stabiliser that will hold your finger while you are trimming to ensure that you don’t cut your baby accidentally. The magnifier provides you with a clearer and larger view of the tiny fingers that you are supposed to trim. The built-in nail catcher takes away the burden of cleaning up since it collects the trimmed nails. The child-friendly whale design will attract and soothe your baby. You can flip the magnifier back if you don’t want to use it. They are a bit expensive as compared to others. This baby nail clipper is unique since you get two nail clippers in one set. The two nail clippers consist of a small one that is meant for new-borns while the larger one is meant to be used when the baby has grown. This nail clipper, therefore, has your baby covered throughout her childhood life. A soft over-mold on the handles. 360 degrees of rotation for added control. The two sizes of nail clippers make it suitable for the whole family. The rounded tip makes it safe for the baby. The soft over-mold on the handles ensures that you grip firmly so that you can safely clip your baby’s nails. The stainless steel used to make them makes it easy to sanitise to remove any germs on them. Since the handle can rotate freely in 360 degrees, you will have more control while clipping your baby’s fragile nails. The handles are also designed to allow you clip the nails from any angle. You still need to concentrate while cutting your baby’s nails to avoid nipping her skin. No baby nail clipper is curvier than the Fridababy NailFrida the SnipperClipper. Since everybody loves curves, you and your baby are likely to fall in love with its curved like shape. White grip on the handle. The spy hole acts as a peephole to enable you to see what you are clipping. It has a curved file that is S-shaped so that you can safely smooth down the jagged edges of the nails. The overlapping steel blades enable you to cut your baby’s nails smoothly and silently. The white grip on its handle will enable your hands to grip firmly. The curved shape of this nail clipper will give you a natural feel as you hold it. It’s a bit expensive as compared to other nail clippers. Designed to make trimming safer and quicker, Piyo Piyo baby nail clippers is one of the best infant nail clippers in the market. It features small blades that ensure that you don’t cut or nick your baby’s fingers accidentally. Its thoughtful design is aimed to make life easy and comfortable for babies. Plastic indent that covers the cutting blades. It is very easy to hold while you are using it due to its ergonomic design. Storing it is very easy since you just put it inside its protective case. The plastic indent that covers the steel blades ensures that you don’t cut too dip therefore protecting your baby from cuts. It feels comfortable in your hand. It smoothly cuts your baby’s nails without leaving any sharp edges to file. The yellow plastic that is glued on them may sometimes fall off. Once you hold a new-born baby in your arms and see the innocent gaze with which they look into your eyes trying to crack their first smile, the thought of slicing their fingers and causing them pain will be enough to crush your soul. It’s pretty bad since you won’t be able to make the feeling of guilt go away. I remember when my son was just two weeks old; his nails were very long and sharp that I feared he could damage his eyes. So, being the concerned mother, I quickly bought a nail clipper from the nearby store so I could do something on his nails. He was wrestling his arms while I was trying to trim his fingers and before I knew it, his fingers were bleeding. Though it didn’t get that gory, it really crushed my soul. I really felt like I was very evil for doing that to my baby’s sweet little fingers. I then vowed never to clip his nails again. In the weeks that followed, I could not stand cuts and bruises on his face that he had made due to his hand waving and curiosity. I knew I had to find a solution to this and that is when my friend, a fellow mother, told me about the best baby nail clippers. She recommended the Piyo Piyo baby nail clippers. So I ordered one from Amazon, and I have never regretted using it. I also did some research and found out about some of the best baby nail clippers that I have listed in this article. I would, therefore, recommend that you get one for your baby. If you are pregnant, you can also buy one in advance so that when your baby arrives, you are prepared for her. Most mothers dread trimming their new-born’s fingernails because they fear they might hurt them, but you should not dread trimming your baby’s nails because you are now informed, remember, knowledge is power. With these great baby nail clippers by your side, trimming your baby’s nails will no longer be guesswork. You won’t have to fight with your baby to have his nails trimmed since the nail clippers are designed to make your baby feel comfortable, which will turn the nail clipping session into a bonding time with your baby. All the best baby nail clippers can be found on Amazon at very competitive prices as compared to anywhere else. When Is It the Right Time to Go Out with Your Baby?